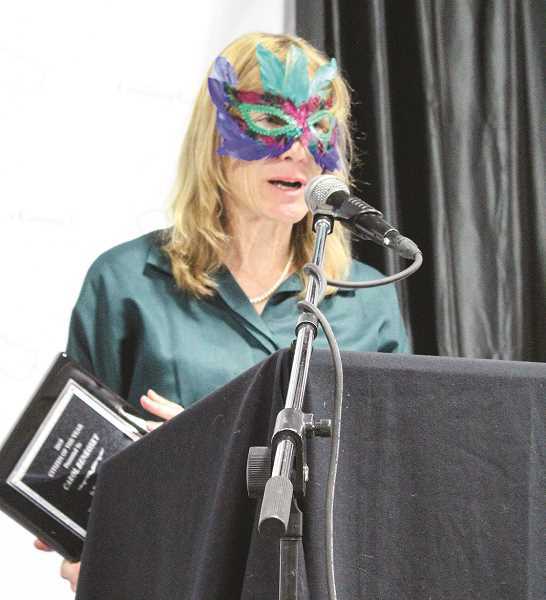 The movers and shakers of Crook County came together to celebrate their successes Saturday evening during the Chamber's Masquerade Gala. "Not only are we recognizing the success of all the businesses here, but we're also recognizing individuals and community members who have made special contributions to Prineville and Crook County," said Prineville-Crook County Chamber of Commerce Executive Director Kim Daniels. "Each nominee tonight has brought something special to this community and this county in 2018." 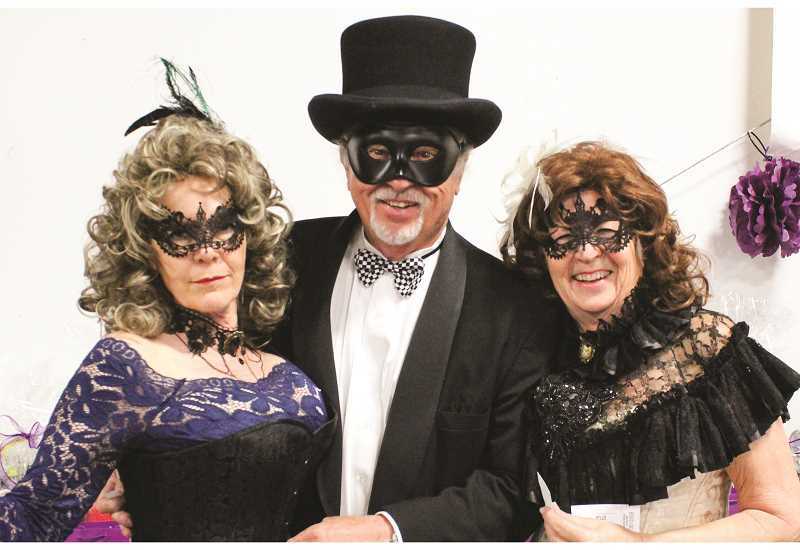 More than 200 Chamber members, dressed in their Masquerade best, attended the 69th Annual Awards Banquet Saturday evening, April 6 in the Grizzly Mountain Pavilion at the Crook County Fairgrounds. "Every year, the Chamber members nominate numerous businesses, organizations and individuals in our community who consistently go the extra mile," Daniels said. The crowd stood and applauded as Beth Grimes received the Lifetime Achievement Award for her decades of service to the community. "Most of you know Beth because she has this little, small hobby. Many of you can share the story of the Grimes Family Christmas Scene, you've heard it so many times," Betty Roppe read from a speech Grimes' daughter had written for the ceremony. Over the years, Grimes has volunteered with Scouts, 4-H, the Crook County Fair and athletics. "Every year for 61 years, Beth Grimes has brought Christmas to our community, selflessly sharing her hobby and her love of Christmas with children of all ages," Roppe read. "She looks nothing like Santa Claus, but really, she is in her own special way." Grimes thanked all of those who volunteer. "I started volunteering a long time ago, and there is nothing more rewarding," she said. 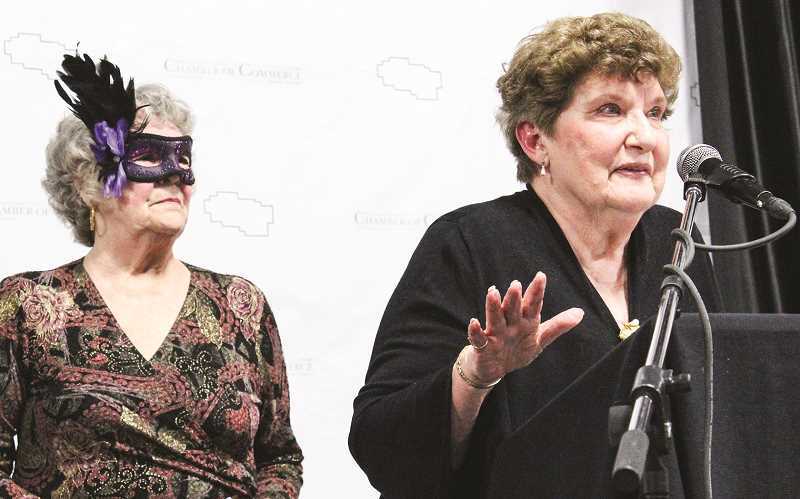 Chamber President Becky Munn presented Carol Benkosky with the 2018 Citizen of the Year Award. "She has taken ownership in making changes and is a networker and a connector," Munn said. Benkosky was honored for her work to add age-friendly benches along Ochoco Creek Pathway and for spearheading an annual Ochoco Creek cleanup. She is an active member of Rotary, Crook County On The Move, and the Crook County Parks and Recreation District Board of Directors. "Thanks to all the people who have supported all the good things that happen in this town and all the volunteers," Benkosky said. "And a huge shout out to the businesses in this town. They are asked constantly to support different things." Chamber board member Sheena York presented Club Pioneer and Dillon's Grill owners Jim and Donna Roths with the Large Business of the Year Award. "They continually reinvest in their business and employees. Their dedication to our community is apparent through their continual engagement in events, fundraisers and partnerships," York said. "This business employs over 60 people. Among those, you can find contagious smiles and amazing customer service." Daniels presented the Small Business of the Year Award to barista Amanda Zimmerman on behalf of Lisa Parker, owner of Prineville Coffee Company. "Those of you that have been there know their employees are fast, they're efficient. They normally know your name and what you're going to purchase," Daniels said. In 2018, Parker and her crew rallied the community to support a local family whose young son became ill. They gathered raffle donations and raised $5,000 for the family. Additionally, they challenged their patrons to buy $5 coffee cards for local veterans and matched the donations, giving 96 coffee cards to local veterans. Chamber board member Duane Garner presented the Visual Enhancement Award to A.R. Bowman Museum Executive Director Sandy Cohen. "One of the downtown areas took on a whole new look in conjunction with the Prineville Railway's 100th anniversary. To help highlight the richness of the Prineville Railway, the Bowman Museum added a caboose exhibit to their collection — the largest artifact on display," Garner said. "It's hard to miss with its bright yellow paint and location right near the crossroads of town." Cohen thanked the business community for supporting the museum. Chamber board member Travis Garner then presented the Kiwanis Club of Prineville with the Community Enrichment Award, which recognizes an organization that enriches the lives of those who live and play in Crook County. Not only have Kiwanians supported multiple community projects, their latest project, the splash pad, is nearing completion. "This project is the latest in a long line of projects that has improved many of our parks and open spaces in Crook County," Garner said. Kiwanian Gail Merritt then presented the 2018 Kiwanis Club of Prineville Cecil Sly Award to Betty Roppe. Sly was a charter member of the Kiwanis Club in 1947 and was an educator and superintendent of schools and believed in community service. Roppe volunteers with the Prineville Hospital Foundation, Humane Society of the Ochocos, Crook County Foundation, local schools, and Our Savior's Lutheran Church in addition to serving six years as city councilor and eight years as Prineville mayor. Merritt said that Roppe is "actively involved as a volunteer and has made a positive impact in the community." Daniels presented the Volunteer of the Year Award to Kathy Eby, a Chamber ambassador who helps with Chamber events, has owned many businesses over the years, and volunteers 20 to 25 hours a week for the Powell Butte Community Charter School lunch program. "She always puts everyone before herself in all that she does. She puts her all into everything that she does," Daniels said. Chamber board member Casey Kaiser presented the Superior Customer Service Award to Bullseye Firearms owners Bill and Lissa Remington. "Their brand of customer service has been to create a place where customers and potential customers can relax while in pursuit of one of the most iconic American pastimes," Kaiser said, adding that they also support the community. Chamber Board Secretary Deb Shaw presented the new Crook County Farming and Ranching Award to Brian, Laura and Adam Barney of Triangle Outfit Inc. The Barneys began their family farming and ranching operation in 1982, producing alfalfa hay, grass and timothy hay, wheat and various crops as well as Angus and Angus Hereford cross cattle. 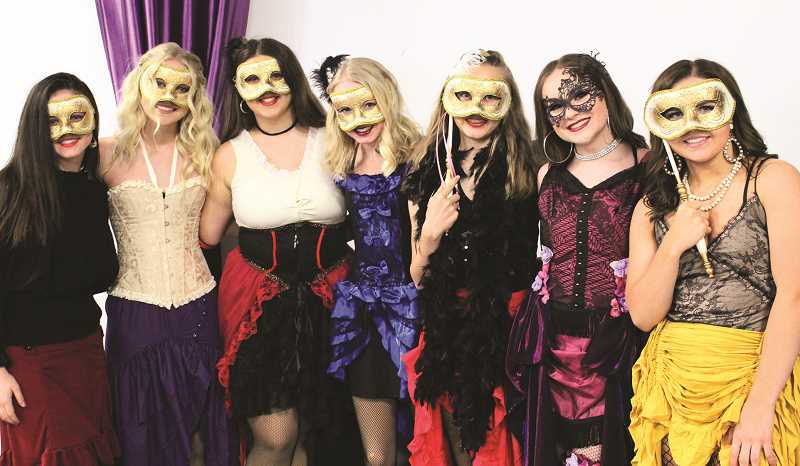 York, of Firefly Events, helped plan and decorate for the gala, which included decorative masks, giant black and purple balloons, and festive table displays. 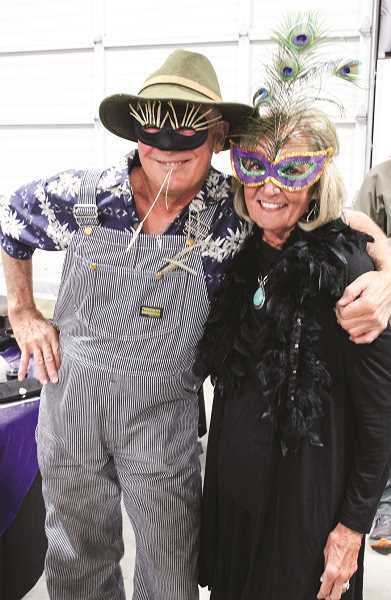 Masquerade Gala guests were treated to a tri-trip and chicken dinner, catered by Bleu Bite Catering, as well as beverages by Ochoco Brewing Company. Chamber ambassadors shared a photo slideshow of 2018 highlights, High Desert Dance Arts students danced, and local student Kyler Michel played the piano. Adam Kraus was the music DJ, while Olive and Blu Photography and Studio Jay took photos throughout the evening. Multiple Chamber members donated gift baskets, which were raffled off at the end of the night. Daniels thanked the attendees for celebrating the 2018 award recipients. "We're learning from their exemplary performance and ensuring the spirit of enterprise in the community continues to evolve in Prineville and Crook County," she said. Crook County Farming and Ranching: Triangle Outfit Inc.